At the weekend I finally managed to meet up with my sister and her other half to exchange our Christmas gifts… I know! I know! But we were both very busy before the event and then she was away visiting in-laws and the like… so Saturday it was. I feel a bit smug about what I got for them though, and it was kind of hand-made… sort of. 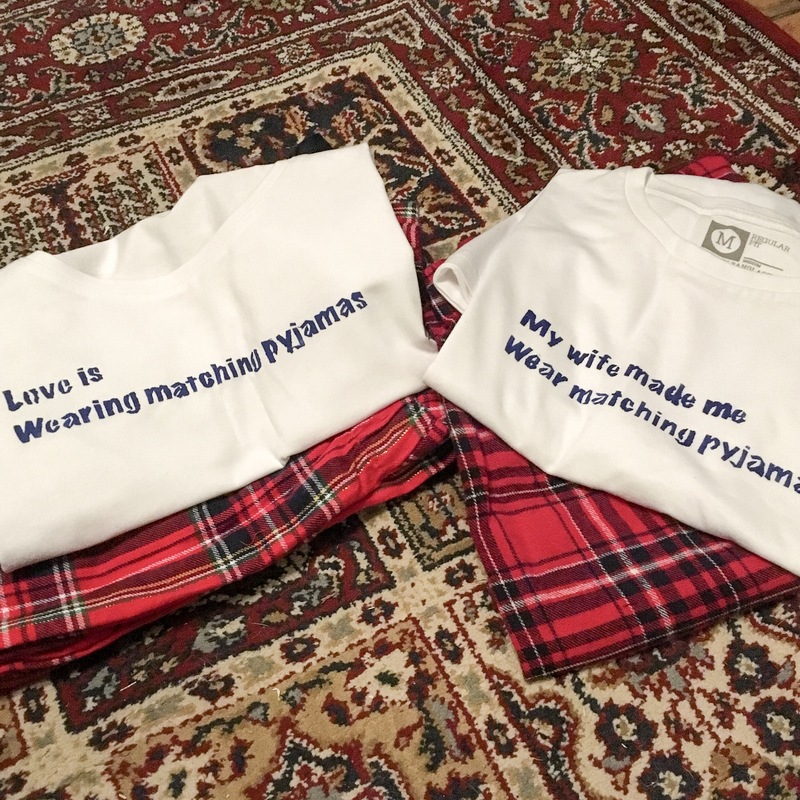 I wanted to get them pyjamas, but I wanted his’n’hers pyjamas as they’re not long married. So after some very frustrating internet searching I decided that all the ones on offer were just too expensive (£40 per set… I don’t think so!!) so I decided to make my own. Step 1… acquire matching pyjamas. More difficult than you’d think, not many places have used the same fabric for men’s and women’s pyjamas. I found a very close match in Primark, the women’s set have a sparkly streak in them too but that’s ok. Step 2… discard the pyjama top and get white t shirts instead… easy peasy, I was already in Primark. Step 3… and this is where things get crafty. Choose a slogan and print it (landscape) out on normal printer paper. 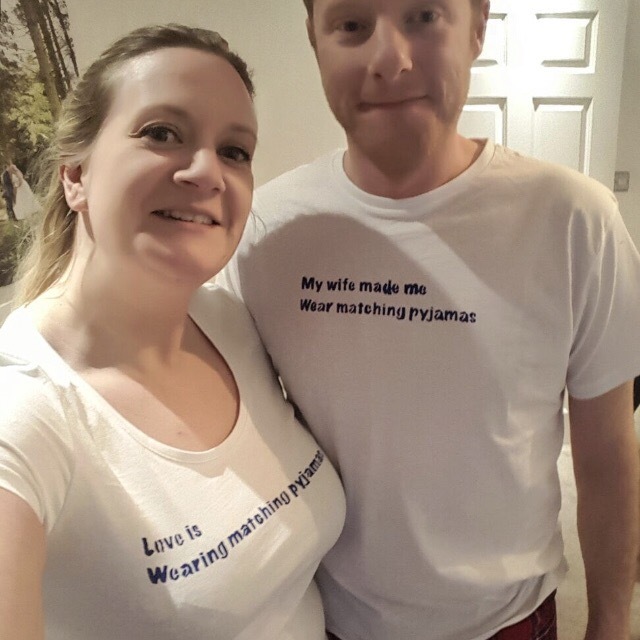 I decided on a cheeky matching set of slogans around the theme of wearing matching pyjamas. Printing the words in bold helps. Putting a stripe of double sided sellotape on the back of the words (the peelable strip type) cut out the words using an artists scalpol… being very careful of your fingers. And on to step 4… the only one I thought to photograph… oh yeah where there isn’t a break in the letters, like with lower case e or o, make one.. you can see the black likes where I’ve done it above. Anyway… step 4… tear off the backing from the double sided tape and position slogan onto fabric. Paint over lightly LIGHTLY! (Too much paint means smudges… trust me) and leave to dry. 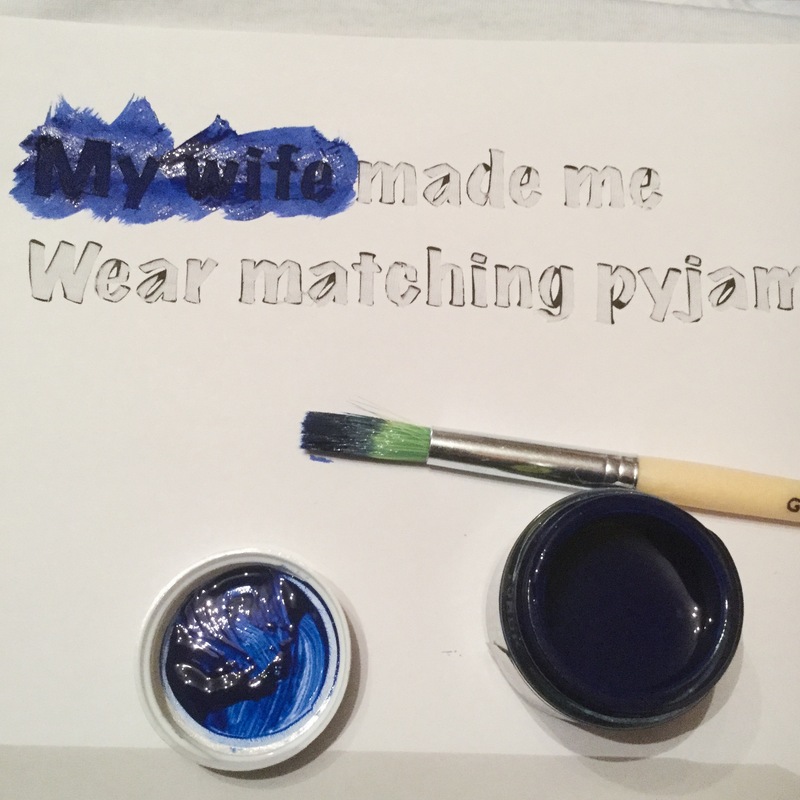 I’ve always used Dylon fabric paint but any fabric paint would work. Step 5… peel the paper away carefully. Place a cloth over the ink and iron it to make it wash proof. There’s a rough rugged charm to the words. Practice makes them neater… but I love this effect! 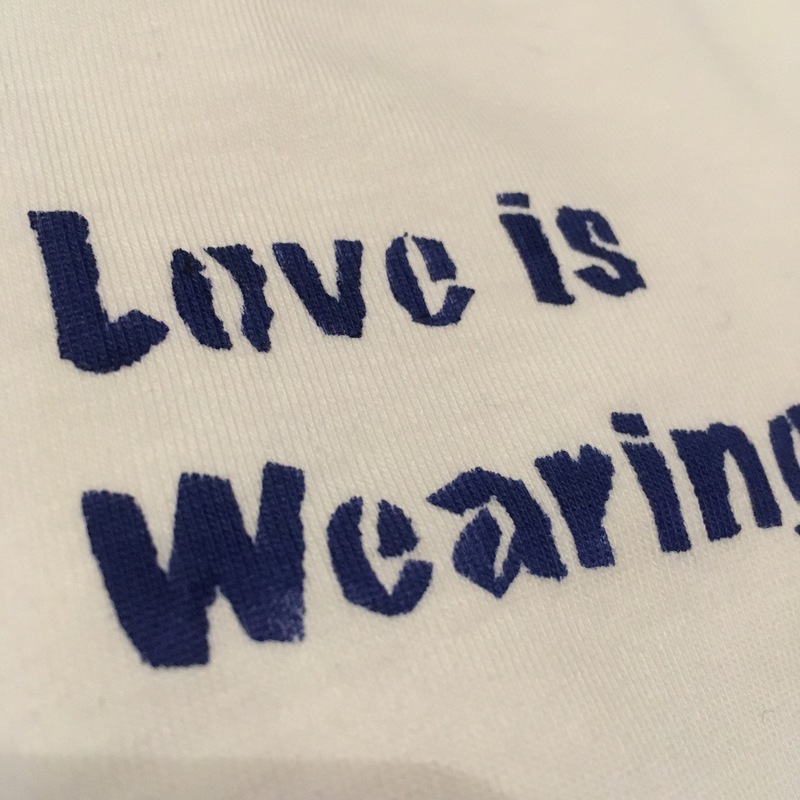 Step 6… stand back and admire your personalised t shirts/gift pyjamas!! I used to do this all the time back in my university days (witty and edgy sloganed t shirts anyone?) and this little project has just reminded me how satisfying it is to do. Plus who else now owns his’n’her pyjamas with those slogans?!! Yeah they loved them! Bonus sister (and sister in law) points right there! !